The prevailing flatness of the Four Corners region is interrupted by several dozen jagged, black peaks, once the magma cores of ancient volcanoes, that have been left isolated long after the softer surrounding rock eroded away. The area has been geologically dormant for approximately 30 million years and many of the peaks have themselves now been weathered down though those that remain provide a stark contrast to the surrounding red, sandy desert. Some can be seen along US 160 east of Kayenta, AZ and southeast of Monument Valley, but the biggest is 7,178 foot Shiprock in New Mexico, 10 miles from the Arizona border, which rises 1,800 feet above the high plains of the Navajo Indian Reservation and is visible for up to 100 miles in some directions. 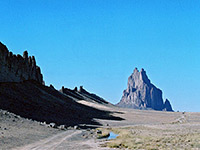 Shiprock is also the name of a Navajo town 13 miles northeast, the largest settlement in the whole reservation, centered around the junction of US 64 with US 491. The peak is a sacred place to the Navajo, who know it as Tsé Bit' A'í, 'the rock with wings', since a legend tells of a time when the mountain moved like a bird, transporting the Navajo away from a distant land where they were under attack, to their present home in this part of the Southwest. 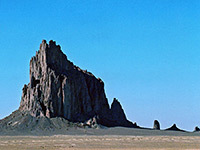 Climbing Shiprock has not been permitted officially since the early 1970s, though this may still be possible if permission is obtained, and there is no obvious promotion of the place at all, with no signpost or any nearby facilities. The peak lies on mostly empty land, but privately owned and with a few scattered dwellings nearby, though it is easy enough to reach. The rock can be seen from along highway 64, but much better by driving 7 miles south on US 491 then 6 miles west along BIA-13, the Red Rock Highway. Radiating from the peak are six volcanic dykes, the longest and most impressive running southwards for 5 miles, rising up to 150 feet though just a few feet across at the top. BIA-13 cuts through the southern end, en route to the town of Red Rock in Arizona. Several bumpy tracks lead north across sandy, sparsely grassed land towards the main peak for more close up views, though the perspective of the jagged black summit from the highway is impressive enough. Although there is not much to do here apart from take photographs, Shiprock provides a iconic Southwest image, of isolation, erosion and mystery. Apart from the town of Shiprock, the nearest places with hotels close to this area are Farmington (42 miles), Cortez (56 miles) and Chinle (70 miles).